‘Cook a Bank Holiday meal for your family,’ said BritMums. ‘Share your recipes with us,’ they asked. ‘Let us know how much it cost,’ they reminded. Let’s be honest, who can resist a roast leg of lamb? Except people who don’t eat lamb. And vegetarians. 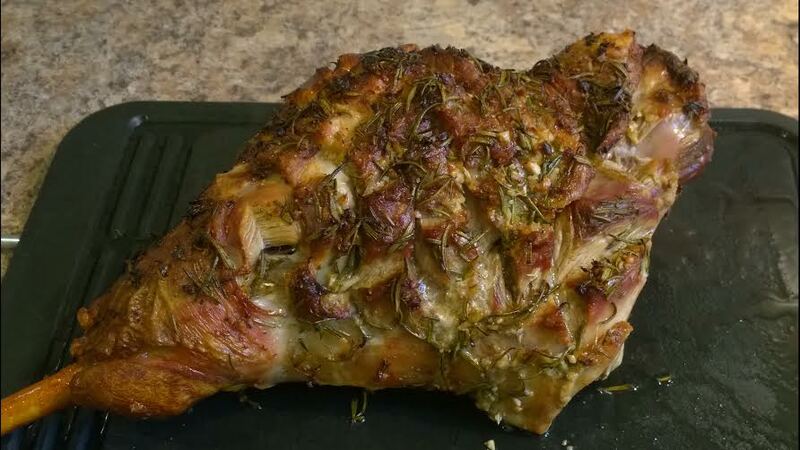 But not us: lamb is this family’s default Sunday Roast, and last weekend was no exception. Our leg of lamb from Morrisons was carefully selected by John The Butcher, and it was absolutely perfect. It was served with Jersey Royals, steamed spring greens and brocolli, and I am pleased to report that all plates were cleared. Twice. 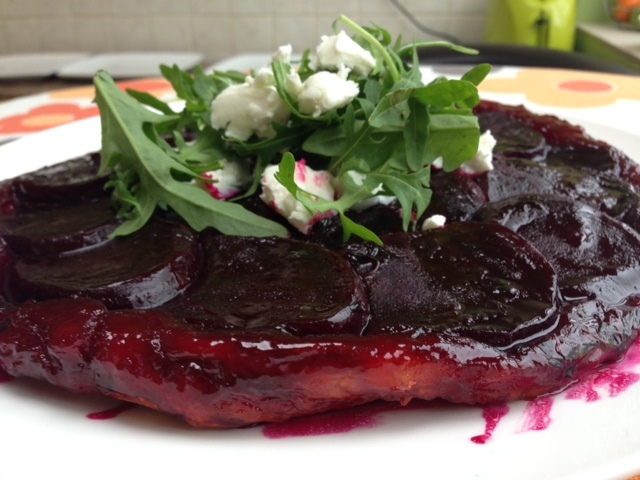 In honour of the occasion, I also threw in a starter and a dessert: namely a beetroot tarte tatin with goat’s cheese and rocket, and a tarte au citron with raspberries. Both of these can be made ahead and frozen, which makes life so much simpler when trying to juggle a roast dinner. ‘The cost of your meal?’ I hear you ask. Are you ready for the maths? Here goes…. The main expense was the 2kg leg of lamb, at £20.58. The accompanying vegetables were a total of £5.78. The starter ingredients cost just £4.35, plus a few store cupboard ingredients such as sugar and sherry vinegar. The dessert came in at £3.68, again plus some plain flour, butter and eggs I already had. The entire meal for 9 adults cost a stunning £3.82 per person. What a bargain! So, now the maths is out of the way, on to the more interesting subject of the recipes. 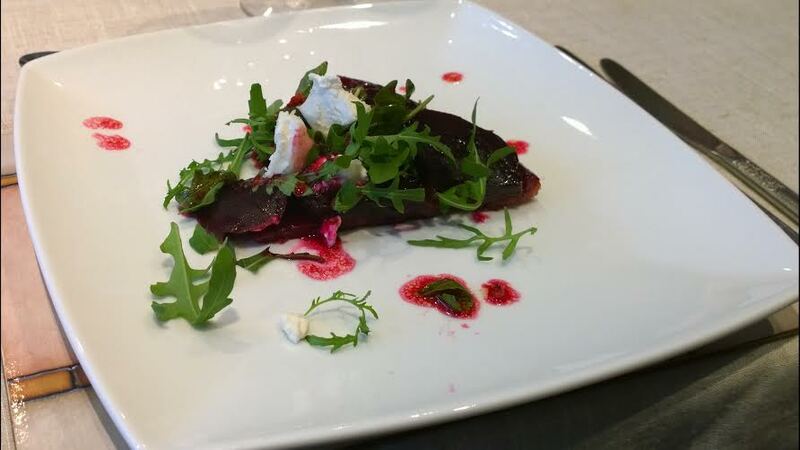 This is a superb starter, but also an amazing lunch for four people. It can be made a day ahead and heated up, or frozen until needed. The trick is to leave it in the tin until you are actually going to serve it. Ideally it should be cooked in an oven-proof frying pan, but as I usually freeze it, I make it in a loose-bottomed flan tin. Heat the sugar in a heavy pan – keep it over a medium heat but stir continually, until it has dissolved. Add a good pinch of salt, the butter and the sherry vinegar, along with the leaves from a couple of Thyme sprigs. The caramel will start to go foamy. Continue heating and stirring until it has gone a nice deep brown. Remove from the heat and pour into a tin lined with greaseproof paper (make sure the paper goes up beyond the top of the tin to retain any caramel that might try to climb out during the cooking process). Thickly slice the beetroot and arrange carefully on top of the caramel, working round the tin in a spiral pattern. Fill in any gaps with the smaller slices. Season with salt and pepper. Roll out the pastry until it is just slightly larger than the tin. Lay it centrally over the beetroot, and tuck the edges deep down into the sides of the tin (a spoon handle is useful for this). If serving at a later date, refrigerate or freeze at this stage. Pop the tin into a pre-heated oven at 180C, Gas mark 4, and cook for about half an hour until the pastry is well risen and golden brown. To serve, place an upturned plate over the tin and, holding them tightly together, flip over. Allow about 30 seconds for the caramel to ooze out of the tin and then remove. Serve with crumbled goat’s cheese and a handful of rocket, not forgetting a drizzle of any beautiful purple caramel. Preheat the oven to 200ºC/400ºC/gas 6. Score the skin of the lamb. Mix the crushed garlic, chopped rosemary, lemon zest and olive oil together. Season the lamb with salt and pepper and rub the marinade into it. Place on a rack in a large tin. Roast the lamb for an hour and a half . About half way through, add half the stock to prevent all the juices burning to the bottom of the tin. I used this stock, plus the extra, to make my gravy. If you prefer your lamb still fairly pink, reduce the cooking time by 15 minutes. When the cooking time is up, remove from the tin, cover with foil and rest for at least 15 minutes before serving. I used the reduced stock left in the pan to make a simple gravy, by cooking with a little flour and adding fresh stock. 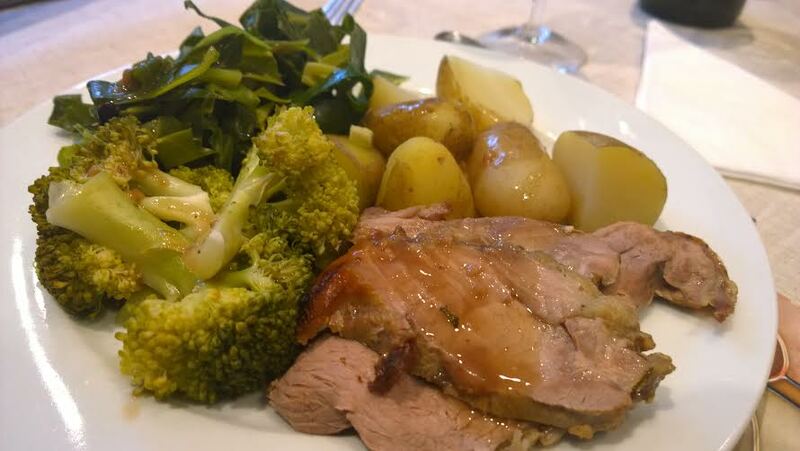 The lamb was served with boiled Jersey Royals, steamed spring greens and broccoli. 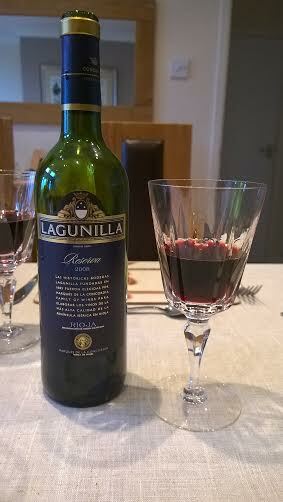 Oh, and the bargain bottle of Rioja, of course. 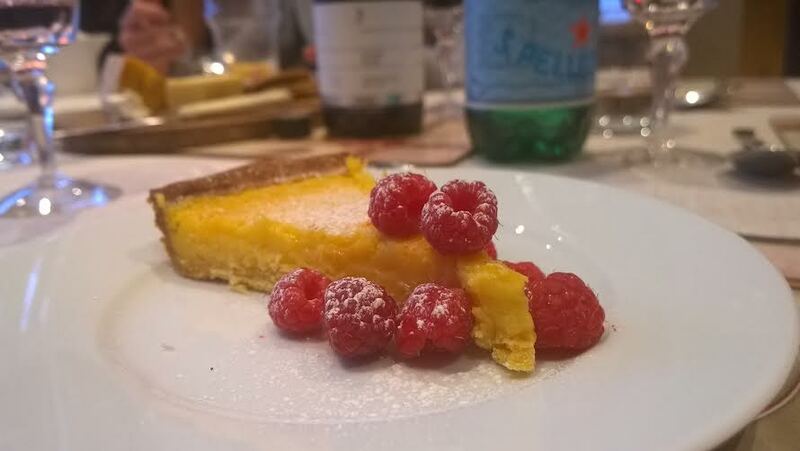 The tarte is slightly complicated, the raspberries are not. The hardest part is the pastry; master that and you’re onto a winner. Just follow everything Mary says, and you’ll be just fine. 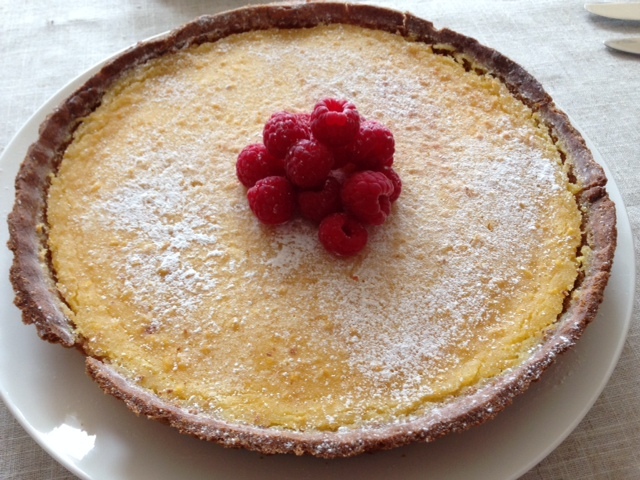 The best way to serve it is at room temperature, with a handful of fresh raspberries and a good dusting of icing sugar. Don’t panic if the pastry cracks or breaks slightly, it is very delicate, and nobody will care how it looks once they’ve tasted it. Good post m’dear. All looks fab. Might try the lemon tart thingy. The lemon tart thingy comes highly recommended. And it freezes like a dream too. thanks Kate…although beetroot’s a dangerous game with a wedding dress!